Overcoming drug resistance in ovarian cancer is the overarching goal in gynecologic oncology. One way to increase drug cytotoxicity without increasing the drug dose is to simultaneously apply multidrug resistance modulator. Valspodar is the second generation P-glycoprotein 1 modulator capable of reversing multidrug resistance in different cancers. In this study, we evaluated the effect of valspodar and cisplatin co-treatment on cell viability, cell death and oxidative status in ovarian cancer cells. The two cisplatin-resistant human ovarian cancer cell lines SK-OV-3 and MDAH-2774 were treated with cisplatin, valspodar, or cisplatin+valspodar for 24 and 48 hours. Untreated cells were used as control group. Cell viability was evaluated by MTT assay. Cell death was assessed by TUNEL and comet assay. Lipid peroxidation (malondialdehyde) and protein thiol groups were analyzed as oxidative stress markers. The expression of mitochondrial superoxide dismutase (MnSOD) was assessed by immunocytochemistry. Valspodar effectively reduced the resistance of SK-OV-3 cells to cisplatin, as demonstrated by increased oxidative stress, decreased cell viability and increased apoptosis in SK-OV-3 cells co-treated with valspodar and cisplatin compared to other groups. However, valspodar did not affect the resistance of MDAH-2774 cells to cisplatin. 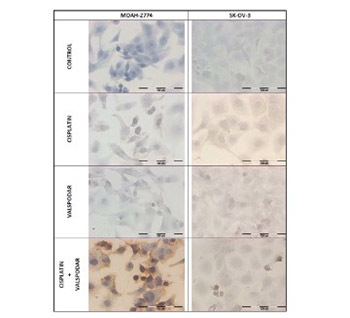 Stronger staining for MnSOD in MDAH-2774 vs. SK-OV-3 cells after co-treatment with cisplatin and valspodar may determine the resistance of MDAH-2774 cell line to cisplatin.